The Hooters are an American rock band from Philadelphia, Pennsylvania. By combining a mix of rock and roll, ska and folk music, The Hooters first gained major commercial success in the United States in the mid 1980s due to heavy radio and MTV airplay of several songs including "Day By Day," "And We Danced" and "Where Do The Children Go." Their popularity resulted in the band opening the Philadelphia portion of the Live Aid benefit concert in 1985. 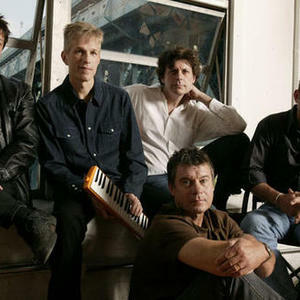 During the late 1980s and 1990s, The Hooters found significant commercial success internationally, especially in Europe, where they played at The Wall Concert in Berlin in 1990, before they went on hiatus in 1995. Since reuniting in 2001, The Hooters have staged successful tours in Europe and 2007 saw the release of their first album of new material since 1993, Time Stand Still. The Hooters were formed in 1980 and played their first show on July 4 of that year. They took their name from a nickname for the melodica, a type of keyboard harmonica which is German in origin and made by Hohner. Two of the members, Eric Bazilian and Rob Hyman, originally played in a band in the late 1970s called Baby Grand and released two albums on Arista Records. During the 1980s, The Hooters played on the Philadelphia club scene, boosted by airplay on WMMR, the major rock radio station in Philadelphia at the time. They soon became a huge success along their native East Coast, playing everything from clubs to high schools, while appearing on local television shows. In 1982, Bazilian and Hyman were asked to write, arrange and play on the debut album of a relatively unknown singer named Cyndi Lauper, She's So Unusual, who was being produced by their former bandmate from Baby Grand, Rick Chertoff. Hyman co-wrote the song "Time After Time," which would go on to hit Number 1 on the Billboard Hot 100 Singles Chart and was subsequently nominated for a Grammy Award for Song of the Year. In 1983, The Hooters released their first independent album, Amore, which sold over 100,000 copies and introduced the original versions of songs like "All You Zombies," "Hanging On A Heartbeat," "Fightin' On The Same Side" and "Blood From A Stone," all of which would reappear in different versions on later albums. Although a studio album, Amore captured the same spirit that made The Hooters admired for their live performances. The Hooters presence, as performers and as songwriters, was recognized when, on July 26, 1984 at the Four Seasons Hotel in Philadelphia, Columbia Records signed them to their first major recording contract. The Hooters' 1985 Columbia Records debut album, Nervous Night, achieved platinum status around the world, selling in excess of 2 million copies and included Billboard Top 40 hits "Day By Day" (No. 18), "And We Danced" (No. 21) and "Where Do The Children Go" (No. 38). Rolling Stone named The Hooters the Best New Band of the Year. On July 13, 1985, they were the opening band at the Philadelphia Live Aid benefit concert, gaining international recognition for the first time. Their first major overseas tour came later that year when they played throughout Australia. On June 15, 1986, The Hooters participated in A Conspiracy of Hope, a benefit concert on behalf of Amnesty International, at Giants Stadium in East Rutherford, New Jersey. On September 5, 1986, The Hooters appeared on the 1986 MTV Video Music Awards, where they were nominated in the category of Best New Artist in a Video for "And We Danced." They performed two songs on the show, "And We Danced" and "Nervous Night." At Billboard's 8th Annual Video Music Conference on November 22, 1986, The Hooters won two awards: Best Concert Performance for the "Where Do the Children Go" video and Best Longform Program for the full length Nervous Night home video. They also placed in five categories in Billboard's Top 100 of 1986: Top Pop Artist, No. 41; Top Pop Album, No. 23; Top Pop Album Artists/Groups, No. 16; Top Pop Album Artists based on one album, No. 27; and Top Pop Singles Artists based on three singles, No. 3. On November 24, 1987, Thanksgiving night, The Hooters headlined the Spectrum in Philadelphia for the first time. The show was broadcast live on MTV and the Westwood One radio network simultaneously, the first time the two networks had ever joined forces in producing a concert for one artist. In 1987, The Hooters experienced their first major commercial success in Europe. After heavy airplay in the United Kingdom, "Satellite," from the album One Way Home, became a hit single, reaching No. 22, with the band performing on the popular British television show Top of the Pops on December 3, where they would meet one of their musical idols, Paul McCartney. "Satellite" was also featured on an episode of the television show Miami Vice titled "Amen...Send Money," which first aired on October 2, 1987. 1989 saw their final release for Columbia Records. Zig Zag introduced a politically-oriented theme, with Peter, Paul and Mary providing background vocals for an updated version of the 1960s folk song "500 Miles," which became an international hit that lead the way to another international success for the band. As the 1990s dawned, The Hooters' success in the United States began to wane, while their popularity overseas, especially in Europe, reached new heights. Following a show at The Town & Country Club in London, England in March 1988, the band had met Roger Waters of Pink Floyd, who told them that he was a big fan of theirs. This eventually lead to their appearance in Waters' staging of The Wall Concert at Potsdamer Platz in Berlin on July 21, 1990, with Sin?ad O'Connor in "Mother" and three former members of The Band (Rick Danko, Levon Helm, and Garth Hudson) providing backing vocals. 1993 saw their debut album for MCA Records, Out Of Body. While not a commercial success in the United States, the album found a large audience in Europe, especially in Sweden and Germany. The Hooters Live, recorded over two nights in Germany in December 1993, was released in Europe and Asia in 1994, but never saw a release in the United States. The Hooters continued to tour throughout Europe until 1995, before taking a hiatus as a band. For several years, the members of The Hooters went on to pursue individual projects in a variety of fields, both in and outside of music. Guitarist Eric Bazilian became recognized internationally for being a songwriter, session musician, arranger and producer for numerous artists throughout the United States and Europe. In 1995, he played all those roles for Joan Osborne's debut album Relish, which was nominated for six Grammy Awards, including Song of the Year for the No. 4 Billboard hit "One of Us," which Bazilian single-handedly wrote. He also released two solo albums: The Optimist in 2000 and A Very Dull Boy in 2002. Keyboard player Rob Hyman built his own recording studio, Elmstreet Studios, in suburban Philadelphia, while also contributing to numerous musical artists as a songwriter, session musician, arranger and producer, among them being Joan Osborne and Ricky Martin. Drummer David Uosikkinen, having moved to San Diego, California, launched an independent record label, Moskeeto Records, while also working as a drummer for various artists including Patty Smyth, Cyndi Lauper, Rod Stewart and Alice Cooper. In 1999, he joined a group of technology experts who created an online music portal, MP3.com, which subsequently contributed to a change in the music industry's distribution and consumer listening habits. Guitarist John Lilley started his own landscape gardening business, Avantgardeners, in the Philadelphia area. Bass player Fran Smith Jr. joined the original Broadway cast members as Paul McCartney in Beatlemania. He also played the part of Carlo Cannoli in Tony n' Tina's Wedding, the longest running off-Broadway theatre comedy. From his own recording studio, he produced numerous artists, including Joe Piscopo and Flo & Eddie of The Turtles, as well as local artists and bands. In 1995, he released a solo album, For No Apparent Reason. Except for a small reunion heard on the concept album Largo (which featured appearances by all the members except for Lilley) in 1998, The Hooters did not play together again until November 21, 2001, when they performed at the Wachovia Spectrum in Philadelphia for a one off show to celebrate disc jockey Pierre Robert's 20th anniversary at local rock radio station WMMR, the first major station to ever play The Hooters back in the early 1980s. 2003 saw a full-time reunion of The Hooters in Germany, where they completed a successful 17-city tour. The success of the tour prompted two further tours in 2004 and 2005, where they premiered new unreleased songs and played in additional countries, including Switzerland and Sweden. On May 11, 2004, The Hooters were presented with a Lifetime Achievement Award from the Philadelphia Music Awards. November 2005 marked the appearance of The Hooters on VH1 Classic's concert series Decades Live Rock as guests of Cyndi Lauper, where they performed "And We Danced" and "All You Zombies." June 2006 finally saw The Hooters play their first official shows in the United States in over a decade. Over the course of three nights, they performed three shows: a homecoming show at Philadelphia's Electric Factory on June 16; a show at The Borgata in Atlantic City, New Jersey on June 17; and finally, an outdoor show at Hubbard Park in Rob Hyman's hometown of Meriden, Connecticut on June 18. Following these shows, The Hooters entered Hyman's Elmstreet Studios to record their first album of new material since 1993. Time Stand Still was released in September 2007, preceded by a tour of Europe from June through August, with shows in Germany, Sweden, The Netherlands and Switzerland. In November 2007, The Hooters returned to Europe for a short tour of Switzerland and Germany, including a show filmed for television in Basel, Switzerland as part the AVO Concerts Series. They then played two shows in the United States during Thanksgiving week in their hometown of Philadelphia at the Electric Factory on Wednesday, November 21 and Friday, November 23, with the latter show broadcast by radio station WXPN in 85 markets. On February 28 and March 1, 2008, The Hooters once again entered Elmstreet Studios to begin work on a new album. Accompanied by Ann Marie Calhoun on violin, the band recorded acoustic rearrangements of 14 of their previously released songs, which will be put on a double-disc set to be packaged with an album that was recorded during the band's concerts the previous year at Philadelphia's Electric Factory, and will be released later in 2008. March 2008 saw The Hooters embark on a series of shows in the United States in support of Time Stand Still, which saw a Stateside release the previous month, including at B.B. King's Blues Club and Grill in New York City on Thursday, March 6, and The Birchmere in Alexandria, Virginia on Saturday, March 29. In July 2008, The Hooters launched a European summer tour, playing shows in Norway, Sweden, Germany and Switzerland.